Sony Xperia SP is an Android smartphone. The smartphone now launched in India for Rs. 27,490 INR. Sony Xperia SP sports 4.6 inch capacitive HD reality touchscreen with 720 x 1280 pixel screen resolution, 16 Million color, and Mobile Bravia Engine 2. It pre-loaded with Android v4.1 Jelly Bean operating system and it has a 1.7 GHz Dual-core Snapdragon S4 processor that mounted on Qualcomm MSM8960T chipset and it’s 1 GB RAM gives super multi-tasking performance. Adreno 320 GPU futures best graphics performance. Sony Xperia SP come with dual cameras, 8.0 Megapixel rear facing autofocus camera and 0.3 Megapixel VGA front facing camera with video call facility. Rear camera features HDR image and video recording, LED flash, Geo tagging, Touch focus, sweep panorama, Smile and face detection, etc. Sensors have an important role to capture HD images and Recording HD videos; so the smartphone equipped with proximity, Accelerometer, compass, gyro sensors. The device has 8 GB of internal memory for storage needs and external memory expandable up to 32 GB using MicroSD card slot. 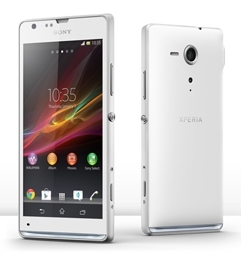 Xperia SP powered by a 2370 mAh Li-Ion battery that gives standby time up to 635 hrs on 2G networks and 734 hrs on 3G network. Included connectivity options are 3G, Wi-Fi, GPRS, USB, Bluetooth, and GPS.